The watch company Graham has introduced a new watch model Swordfish Booster Iris with its original iridescent colors of the case. Variety of colors on the case is mesmerizing and attracting with its rich iridescent hues. In translation from the Latin Iris means "rainbow." Rainbow effect is obtained not by covering the case with paint, but through the interference of light waves. A similar effect is observed on the surface of a soap bubble or oil slick on the wet pavement. Change the color is achieved through the use of complex structure oxide layers. Steel casing and other components of the watch are placed in a large vacuum chamber, which produced plasma reactions. This unique coating comprises a multilayer structure that provides overlaying ultrathin films on each other. A thick layer over the entire surface causes a change of colors in reflected light. The rainbow colors transfusion gives the case a particular specificity. The steel case in diameter of 48 mm is covered with a black PVD-coated. 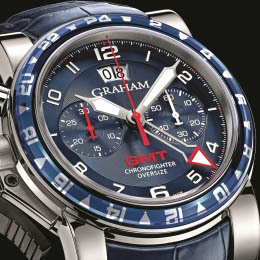 The buttons of the chronograph and the crown, placed on the right side, are decorated with "the Cotes de Geneve." Steel bezel securely fastens the flat sapphire crystal with antireflection coating to the case. The sapphire glass also serves as a transparent screwed case back. The water resistant of the model is up to 100 meters. Black mother of pearl dial is equipped with two snailed displays. The size of the displays is increased in 15%. Centre hands with black-tipped are skeletonised. The black second hand and indexes are perfectly in tune with the large gray hour and minute markers and hands of the displays. Timing functions are displayed on the "portholes" in positions 3 and 9 o'clock. This luxury chronograph is based on automatic chronograph caliber G1710 of a 48-hour power reserve and a balance frequency 28,800 vph. The mechanism on 34 jewels is equipped with the shock absorber Incabloc. Strap, integrated into the case, is made of green crocodile skin and has a contact buckle. The novelty is available for 15 000 Swiss francs.